We’d love your help. 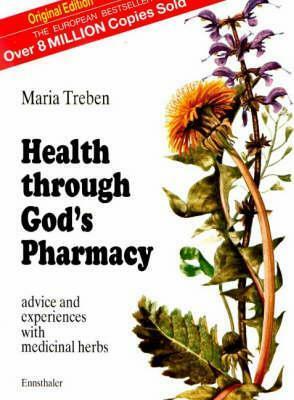 Let us know what’s wrong with this preview of Health through God's pharmacy by Maria Treben. To ask other readers questions about Health through God's pharmacy, please sign up. It can almost be rated as pathetic on how much I drooled for this book. I heard of it through the listmaster, Sorcy, of HerbalHealers, as a top favorite. And of course it features so much on the infamous Swedenbitters. Maria Treben was a highly respected herbalist, well sought after for lectures in Europe. Her books have always been well recieved, selling several million copies in many languages, igniting thousands of testimonials on how well the remedies listed within worked. This book, at a me It can almost be rated as pathetic on how much I drooled for this book. I heard of it through the listmaster, Sorcy, of HerbalHealers, as a top favorite. And of course it features so much on the infamous Swedenbitters. Maria Treben was a highly respected herbalist, well sought after for lectures in Europe. Her books have always been well recieved, selling several million copies in many languages, igniting thousands of testimonials on how well the remedies listed within worked. This book, at a mere 88 pages, does indeed list many remedies and personal triumphs in the healing field, all from someone who knows her stuff and believes firmly in it. The book begins with the usual information - really brief explanations on creating tinctures and salves and such, gathering herbs and dryng them, the usual stuff, only taking up around 3-4 pages. The second section, the majority of the book, follows, listing 31 herbs. Some have more information than others, almost all having personal stories from Treben on their actions. Health Through God's Pharmacy really shines in that its from someone with so much experience and love for nature, so much assurance and honesty regarding what she does. Finding advice for malignant diseases is uncommon in general herbals, so that was welcomed here. I was a bit put off by so many cautionary "see your doctor first" comments, as I didn't expect that HERE with this one, but I can let that pass. I'd have loved for this to be longer, though, telling more on the conditions with more details. It's pretty short and because of that not too much can be relayed. For the length that's here though, it's great. I'm eager to check out her other books for comparison. Some good and less good things in this book. -At the beginning, clear explanations on how to prepare the herbs, to make infusion, ointment, etc. -Plants and then health problems sorted in alphabetical order. -A special chapter about Swedish Bitters. -Interesting info about the plants like their various folkloric names, and all the details about when and how to recolt them. -The indications about each plant helping for this and that health problem can be a bit too "large" Some good and less good things in this book. -The indications about each plant helping for this and that health problem can be a bit too "large" and repetitive from one plant to another. -No scientific mentions of what elements contained in the plants could explain their effects. Aaaa ich lieb dieses Buch so sehr und moechte eins fuer mich selber zu behalten! Eine Kopie auf englisch waere auch gut, um alles zu vergleichen. Maria Treben war eine österreichische Kräuterkundige und Autorin. Maria Treben was an Austrian herbalist and author.